For correct implant planning based on cone-beam computed tomography (CBCT), the bone contour must be accurately determined. Identification of the contour is difficult in bones with incomplete mineralization. 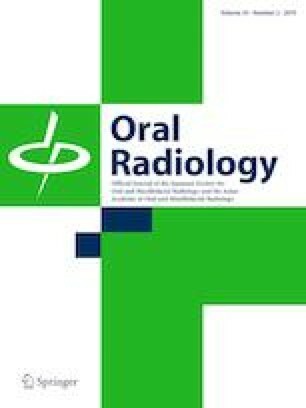 In this clinical study, we investigated the intrapersonal and interpersonal reproducibilities of manual bone contour determination on CBCT images using a semi-automated computerized process. The bone surface level in the area of the socket in 20 patients who had undergone tooth extraction from the upper jaw at 10 ± 1 weeks previously was determined on CBCT images. Two investigators with different levels of experience determined the bone structure initially (T0) and repeated the procedure after 3 months (T1). The bone structure marked on CBCT images was converted into a surface data set. The resulting data sets were superimposed on one another. In the analyses, the shortest distances between the datasets were identified and measured. The average deviations were statistically evaluated. The intrapersonal evaluation resulted in an average deviation of 0.18 mm across both investigators. The interpersonal analysis comparing the two investigators resulted in average deviations of 0.15 mm at T0 and 0.26 mm at T1. Significant differences were not found. The low intrapersonal deviation indicates that the procedure has satisfactory reproducibility. All deviations were within the range of the selected resolution of the CBCT device. Application of a semi-automated procedure to detect the bone border in areas with incomplete mineralization is a predictable process. The study was registered in the German Clinical Trials Register and the International Clinical Trials Registry Platform of the WHO: DRKS00004769, date of registration: 28 February 2013; and DRKS00005978, date of registration: 09 November 2015. The study was funded by Resorba Medical GmbH (Nürnberg, Germany) and the Oral Reconstruction Foundation (Basel, Switzerland) (Grant No. CF 41305). Sigmar Schnutenhaus, Michael Graf, Isabel Doering, Ralph G. Luthardt, and Heike Rudolph declare no conflicts of interest. The Ethical Committee of the Medical Faculty of Ulm University approved the current study design (processing number: 337/12 and 41/14). The trial was registered at the German Clinical Trial Registry and the International Clinical Trials Registry Platform of the WHO, with assigned numbers DRKS00004769 and DRKS00005978.